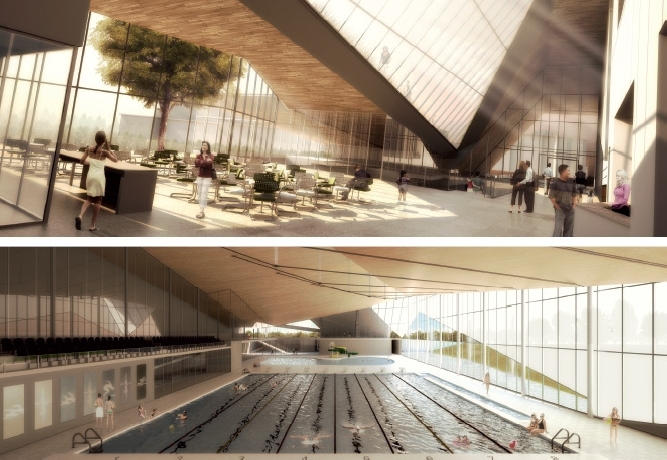 A soccer pitch, pool, and multi-purpose rooms are to be inserted into an existing sports and recreational precinct comprising an arena, outdoor track, school, and nearby library. Situated at the boundary between the built and natural environments, the existing complex faces a busy east-west artery, and backs onto a nature reserve with adjacent residential development. Bicycle and pedestrian paths weave along a linear park buffering the complex from the boulevard, and thread through the precinct leading to the nature reserve and Parc Marcel-Laurin beyond. Contemporary “big-box” programs usually float in a sea of asphalt, with barely more than a nod to their surroundings. Aided by the congruity of site and program, this project demonstrates a more courteous approach, replacing the usual “one-liner” with engaging forms and conversations that occur on many levels, and at scales that address all aspects of the surroundings. Set two meters into the ground, the massive volume is sculpted and modulated to merge with the soft topographic forms of the landscape. 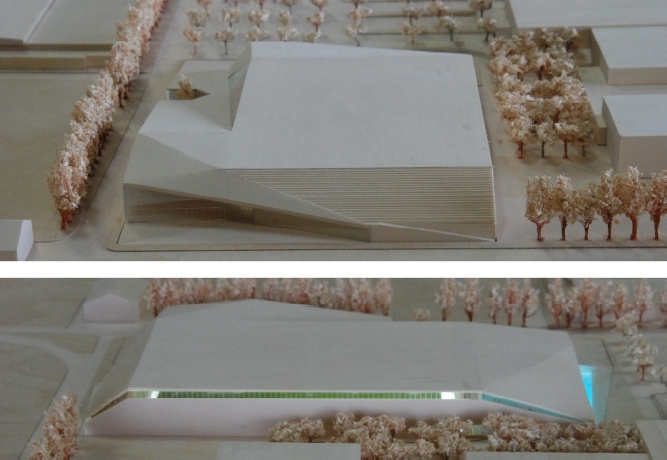 Similarly, the ground plane is carved out, folded, and lifted onto the roof where abstract and natural forms coalesce. 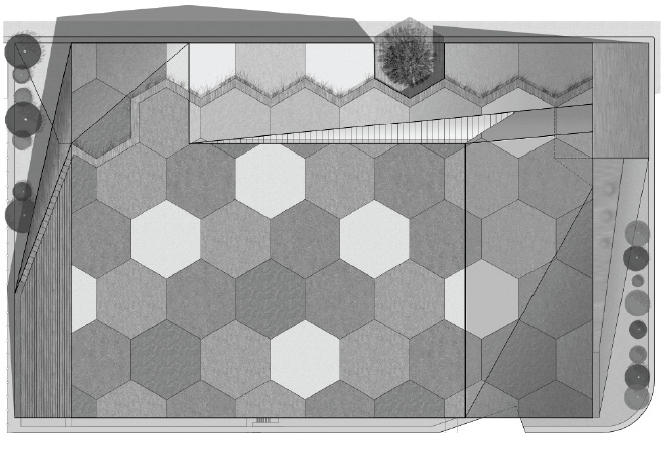 Vegetal and mineral roof patches recall the polygonal form of soccer balls. The roof – a “fifth façade” visible from a principal air corridor above – is accessible to pedestrians. From boulevard Thimens a walkway zigzags up the northeast side of the building, between a glazed fold over the cafeteria and an open courtyard scooped out of the mass to preserve an existing tree. Gradually, the surrounding landscape is revealed to pedestrians as they climb to the top of the bleachers overlooking the athletic field before angling down the back face to rejoin the path leading to the nature reserve. More than a passive container, the building intentionally engages its surroundings and participates in the activities it accommodates, thereby encouraging the same of its visitors. Deferring to its setting, the building nevertheless maintains a striking architectural presence. Where required, the folded roof retains the big-box interior, yet slopes down to the pedestrian scale of the surroundings. Set back from the street, the main façade is backdrop to a new public square: a centripetal void drawing neighbouring buildings together, welcoming visitors, and providing much needed parking. The permeable asphalt, light-coloured to reflect heat, is interwoven with low mounds and planting to reduce surface run-off and soften the visual impact of the cars. The angular form of the main façade at once signals the entry, the topographic intentions, and rooftop activity (the rising zigzag walkway). A reflecting pool carved into the ground functions as a cooling pond and prefigures interior activity. 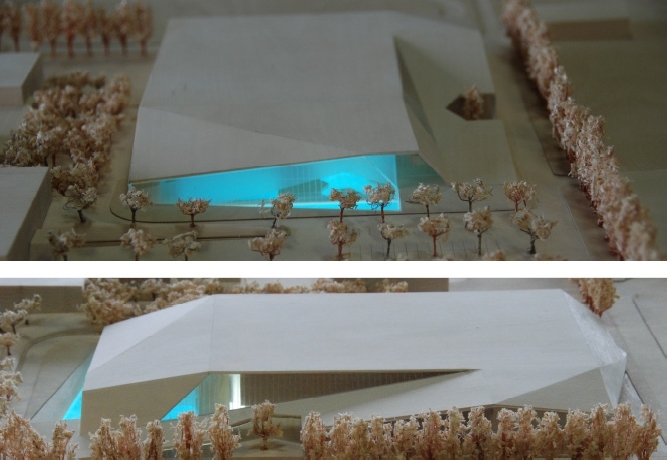 This pool, level and contiguous with the interior pool, is visible through the transparent lower portion of the façade. The upper wall, translucent to cut the glare, transports natural light deep into the interior and, at night, casts an inviting glow. The surprisingly voluminous interior is organized on two planes. Main circulation routes at the entry level overlook the principal activity surfaces below. Echoing the folded surfaces of the exterior, ceilings rise and fall, and inclined surfaces ramp between the two levels. 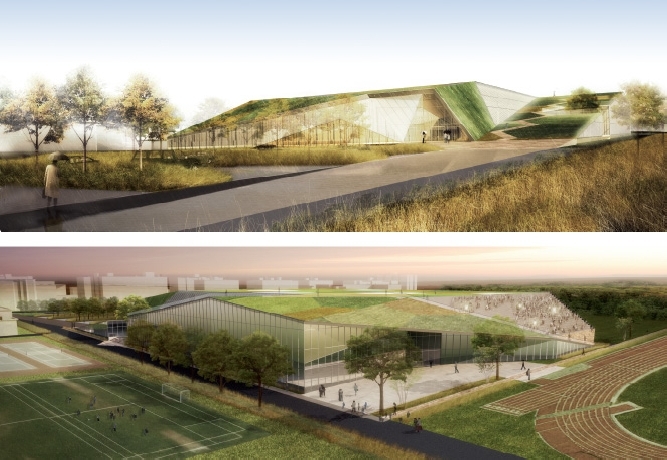 The perforated roof and ground plane, long interior views, and the transparent glazing of the lower facades create a visual permeability connecting all levels, inside and out. Sustainable strategies include: natural and borrowed light, triple glazing, operable windows, FSC wood for ceilings and composite trusses. A double wall faces the prevailing winds, drawing in fresh air (preheated in winter by a solar wall) for natural ventilation. 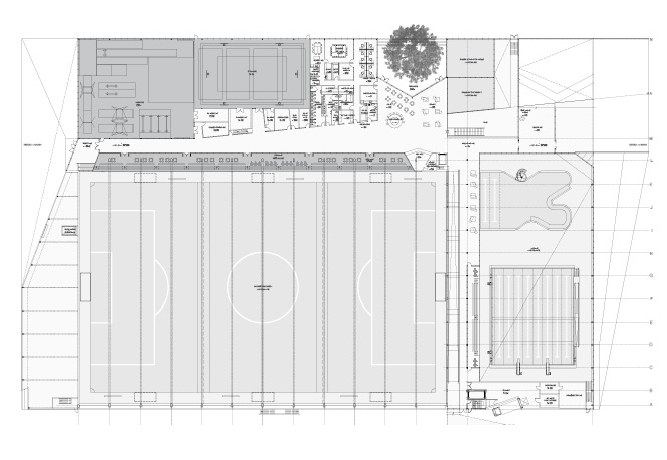 Geothermal shafts, combined with a thermal mass under the entire soccer pitch, temper the interior air in all seasons.